Government-directed prayer in public schools violates the Establishment Clause of the First Amendment, even if the prayer is denominationally neutral and students may remain silent or be excused from the classroom during its recitation. Frankfurter and White took no part in the consideration or decision of the case. The plaintiffs argued that opening the school day with such a prayer violates the Establishment Clause of the First Amendment to the United States Constitution (as applied to the states through the Fourteenth), which says in part, "Congress shall make no law respecting an establishment of religion, or prohibiting the free exercise thereof." The governments of twenty-two states signed on to an amicus curiae brief urging affirmance of the New York Court of Appeals decision that upheld the constitutionality of the prayer. The American Jewish Committee, the Synagogue Council of America, and the American Ethical Union each submitted briefs urging the Court to instead reverse and rule that the prayer was unconstitutional. In an opinion delivered by Justice Hugo Black, the Court ruled that government-written prayers were not to be recited in public schools and were a violation of the U.S. Constitution and the Establishment Clause of the first amendment. This was decided in a vote of 6-1, because before the decision could be announced, Justice Felix Frankfurter suffered a cerebral stroke that forced him to retire, and Justice Byron White took no part in the case. The Court explained the importance of separation between church and state by giving a lengthy history of the issue, beginning with the 16th century in England. It then stated that school's prayer is a religious activity by the very nature of it being a prayer, and that prescribing such a religious activity for school children violates the Establishment Clause. The program, created by government officials to promote a religious belief, was therefore constitutionally impermissible. The Court rejected the defendant's arguments that people are not asked to respect any specific established religion; and that the prayer is voluntary. The Court held that the mere promotion of a religion is sufficient to establish a violation, even if that promotion is not coercive. The Court further held that the fact that the prayer is vaguely worded enough not to promote any particular religion is not a sufficient defense, as it still promotes a family of religions (those that recognize "Almighty God"), which still violates the Establishment Clause. Engel became the basis for several subsequent decisions limiting government-directed prayer in school. In Wallace v. Jaffree (1985), the Supreme Court ruled Alabama's law permitting one minute for prayer or meditation was unconstitutional. In Lee v. Weisman (1992), the court prohibited clergy-led prayer at middle school graduation ceremonies. Lee v. Weisman, in turn, was a basis for Santa Fe ISD v. Doe (2000), in which the Court extended the ban to school-organized student-led prayer at high school football games. ↑ The prayer at issue in the case is presented at Engel, 370 U.S. at 422. ↑ The amicus curiae was joined by the attorneys general of Arizona, Arkansas, Connecticut, District of Columbia, Florida, Georgia, Idaho, Indiana, Kansas, Maryland, Mississippi, Nevada, New Hampshire, New Jersey, New Mexico, North Carolina, North Dakota, Pennsylvania, Rhode Island, South Dakota, Texas, and West Virginia. ↑ A full list of amicus briefs can be found at Findlaw. 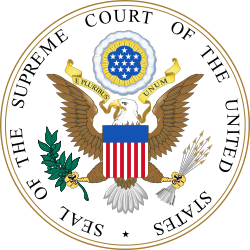 ↑ "U.S. Supreme Court: Engel v. Vitale, 370 U.S. 421 (1962)". Retrieved 2012-05-30. Dierenfield, Bruce J. (2007). The battle over school prayer: how Engel v. Vitale changed America. University Press of Kansas. ISBN 978-0-7006-1525-4. Retrieved 5 July 2012. Kurland, Philip B. (1961). "Of Church and State and the Supreme Court". University of Chicago Law Review. 29 (1): 1–96. doi:10.2307/1598520. .
Schwarz, Alan (1968). "No Imposition of Religion: The Establishment Clause Value". Yale Law Journal. 77 (4): 692–737. doi:10.2307/795008. .
Sutherland, Arthur E., Jr. (1962). "Establishment According to Engel". Harvard Law Review. 76 (1): 25–52. doi:10.2307/1338663. .